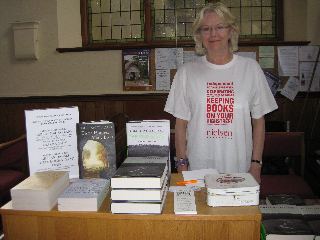 We had a great talk from Robert Macfarlane to launch Independent Booksellers' Week on Saturday (see Merle, above, who works in the shop, gamely wearing the tee-shirt supplied by Nielsen's to promote the week - and Robert, top, chatting to the long queue of people waiting to have their books signed). 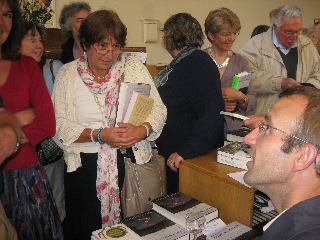 Robert spoke about The Wild Places, and how his walks in Dorset with Roger Deakin had influenced him (Deakin, who died a year or so ago, was the author of Waterlog, a swim round Britain, and Notes From Walnut Tree Farm) . He read from different sections of The Old Ways - this is Radio 4's Book of the Week so you can have some idea of what we enjoyed, though it is not read by the author.